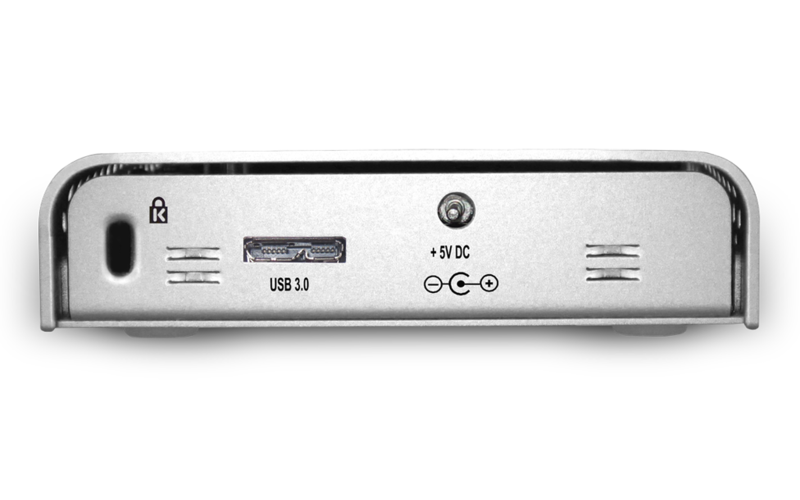 Installing a drive into the miniSwap/U3 enclosure is super simple. Pushing the small black lever on the front of the drive releases the miniSwap/U3’s spring-loaded front panel. Insert the drive (it goes about an inch into the enclosure) and shut the front panel, which pushes the drive into place as it closes. That’s it. Attach the included USB 3.0 cable and connect to your Mac, and you’re done, son. 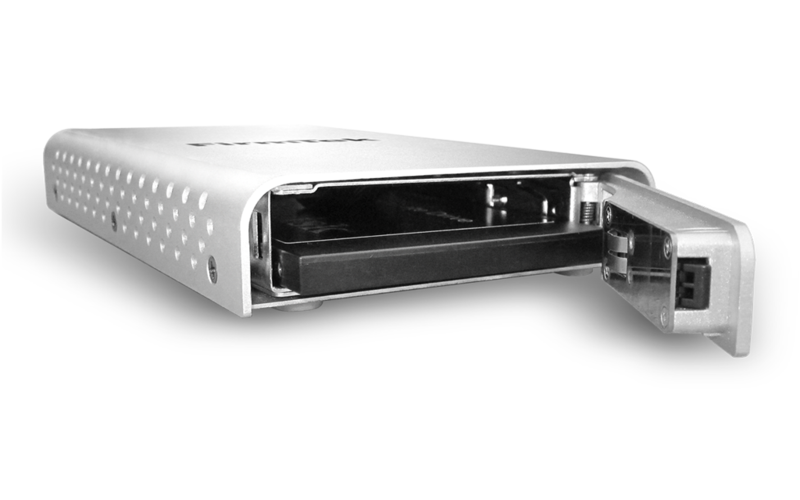 External power was not required for the drives I installed inside the enclosure, but FirmTek sells an optional power adapter should you find one necessary. The miniSwap can handle a variety of drive heights from 7 mm up 14.9 mm. While the case won’t win any beauty contests, its vented aluminum shell does complement the current Mac Pro design and its design allows it to operate without requiring a fan whirring inside. Being able to swap drives out without the need for tools or trays can be very handy. If you like to keep a copy of your files offsite, the miniSwap/U3 would make it easy to rotate backup drives. You can have individual drives for different clients or projects and switch between them easily with the miniSwap. The only downside I see to this strategy is that the drives when outside the enclosure are more vulnerable to damage should you drop the drive on the ground and accidentally run over it with your chair—not that anything like that has ever happened to me, of course. The model we tested had a 240GB SanDisk Extreme SSD and its performance was impressive. Connected to our 2013 MacBook Air, the drive was able to write a 10GB file at 282 MBps and read it at 400 MBps. It wrote a 10GB folder at 270 Mps and read it at 315 MBps. We also ran AJA System Test and found that the drive was able to write at 416.5 MBps and read at 414.4 MBps. We also tested the miniSwap/U3 with a newer SanDisk Exteme II SS that we had in the lab and saw even better performance. The 10GB file read and write speeds hit about 450 MBps and the 10GB folder testhad a write speed of 385 MBps and a read speed of 375 MBps. 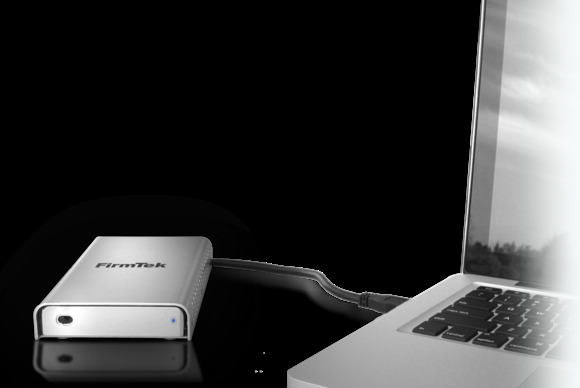 If you have multiple clients, projects that require their own drives, the FirmTek miniSwap/U3 makes it easy and economical to attach and mount drives to your Mac via speedy USB 3. It's easy to insert drives into or remove drives from the miniSwap/U3, and it also provides good USB 3 performance.